Volunteer in a Peruvian Hospital in Cusco. Meet Patricia. She is 24 and a trained nurse from Switzerland. 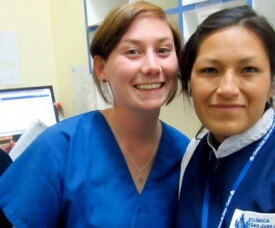 Currently she is living in Cusco (Peru) for a five-month volunteer program in Peru, in a local hospital. Patricia finished her studies for professional operating technique in 2013 and in order to gain more work experience in nursing she decided to further her career and advance her practical skills abroad. That’s when she received information about the Spanish and volunteer programs from AMAUTA Peru and she decided to travel to Cusco.